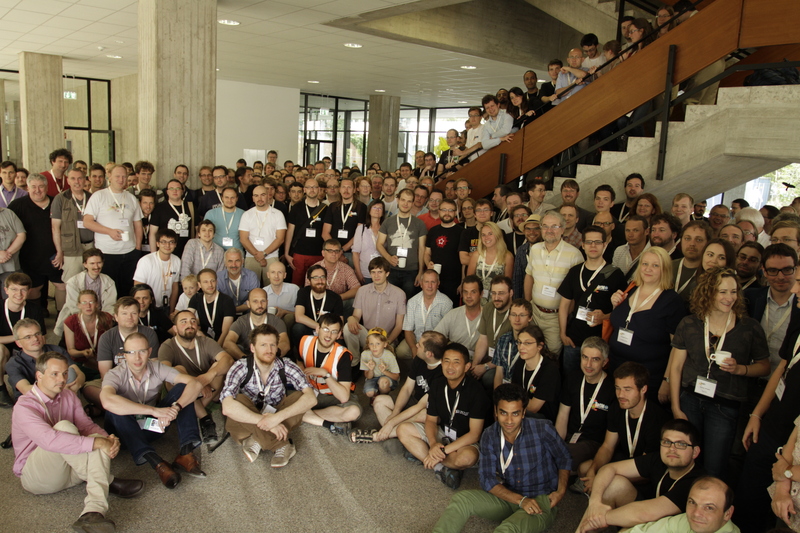 We'd like to thank all participants at SotM-EU 2014. You've come in great numbers from all corners of Europe and beyond - we had people from Russia, Italy, Switzerland, Luxembourg, Great Britain, France, Romania, Ireland, Hungray, Liechtenstein, Austria, Estland, from the US, from Japan, Germany of course and many other places. You made SotM-EU into an OpenStreetMap event that we'll never forget. Thank you to Hochschule Karlsruhe, the University of Applied Sciences, who made the event possible not only by letting us use their venue, but also helping to solve all the little problem that such a big event brings. Special thanks go to the rectorate and building management staff, the maintenance people and the Studentenwerk who opened the Mensa on Saturday for lunch just for us. Extra special thanks to Prof. Dr. Günther-Diringer who fully supported this conference from the first day of planning to the last day of the event. We thank FOSSGIS e.V., the German OSGEo chapter, who promised to stand in if we should end up with any financial loss. We don't have the final numbers yet but it looks like we might have a small surplus that we can use for a closing get-together of the helpers. Also, thank you to the members of the programme committee and Christoph Hormann who headed it and provided hands-on speaker support. Thank you to the team responsible for the programme booklet, and Toursprung and Holger Schöner for making the printed conference map which helped our participants to navigate the tram construction chaos that had gripped Karlsruhe on the conference weekend. Thank you to our many sponsors without whom a conference on this level would have been impossible. Thank you to the many helpers who made sure that things worked. Thank you to the video team for their professional work and to the CCC (Chaos Computer Club) who made the recording equiment available. (All videos are linked from within the schedule.) Special thanks to Bernd Strehhuber of INKA e.V. who delivered an Internet infrastructure that allowed everyone to simply use the network without individial passwords, proxies, or limitations - a network that worked so well you simply didn't have to think about it. Wheter we were at the AKK, in auditoriums, in the catering area, in BoF rooms or at the hack day - the "sotmeu" network was simply there. But we must not forget the catering team, the signposting team, the help desk/registration staff (why do A-L people sleep longer than M-Z people?) and all the university students whose help we enlisted. Rather unexpectedly, our friends at Garmin have made three brand-new hand-held GPS devices available for us to use as prizes during the conference. So, we decided to have a last minute poster competition! At our SOTM-EU venue, there's a lot of empty wall space that we'd like to use for nice OSM posters. And we need YOU to make them! Anything goes - anything that looks great, is funny, or new, or educational. Show us a map you have made, a pretty rendering style, photos from your last mapping event, or a before-after comparison. If you're one of the many people running a web site with their own map style - select a great-looking spot and submit that! You have five days (deadline: Wednesday 11th June in the evening) to submit a poster electronically (PDF or PNG preferred, write to info@sotm-eu.org), and we'll print it and hang it. Or, if you prefer, print it and bring it to Karlsruhe yourself. On Saturday afternoon, we'll ask our attendees which poster they liked best, and before you know it you could be the owner of a brand-new Garmin GPS. You can participate by submitting a poster even if you're not coming to SOTM-EU yourself but in that case it would be great if there was someone at the conference to pick up your prize for you if you should win. We'll make the posters available online for use by the OSM community, so your audience isn't just those who come to the conference - make a nice "This is how OSM works" poster that others can use and re-use and your effort will live on for quite a while. Are you looking forward to the conference? To meet the other OSMers from far and wide? If you arrive in Karlsruhe on Thursday and cannot wait to meet the others, we have something prepared for you. Thursday afternoon and evening you all are welcome for a pre-conference get-together. It starts at 4:00 pm at the AKK and is open-end. We expect you in the AKK biergarten. If you don't find us at once, walk around the building and look for OSM signs. The AKK ("Arbeitskreis für Kultur und Kommunikation") is a rather cool and independent location at KIT ("Karlsruhe Institue of Technology"). Sometimes the café calls itself "Café Selbergroß", which means "you're grown-up enough to do it yourself" - if you want coffee, make yourself one instead of waiting for someone to serve you. This spirit is in line with OpenStreetMap Community, and we will surely feel at home. During our years of study some of us (Christine) spent time here and enjoyed biergarten, schlonz, coffee and people. Some of us also attended the unofficial social event of Linuxtag here (do you recognize Jochen and Fred?). You've already read all about our schedule of excellent OSM talks, but there'll also be plenty of opportunity to talk to other guests at the conference. We're preparing a coffee corner in the lobby of building B where you'll not only find hot and cold beverages, but also ample space to sit and chat. We'll have proper German beer of course, from a small Karlsruhe brewery named Vogelbräu. On Saturday evening you'll have the oppportunity to sample the produce of another local brewery - we have reserved a couple of tables in the biergarten of the Kühler Krug brewery The biergarten is beautifully located right on the shore of our local river Alb - we hope you'll like it! The programme for the State of the Map Europe 2014 in Karlsruhe is finalized. The talks cover all aspects of the OpenStreetMap world, for example rendering and cartography, geocoding, routing, mapping, quality assurance, humanitarian use, cycle maps, mobile apps, and more. Now we are looking for volunteers who help during the talks as speaker supporters or with the video recording. There's no special knowledge required for this. We are also looking for some more experienced people to take the role of session hosts. If you want to help, please put down your name on this wiki page: State of the Map Europe Helpers. Finally we are happy that we can offer a top-class workshop programme during our hack day on Sunday. There will be workshops about Osmium (Jochen Topf), Overpass Api (Roland Olbricht), OpenStreetMap Carto (Andy Allan), and MapRoulette (Martijn van Exel). Telenav is our first gold sponsor. A massive thank-you to our friends at Telenav for helping to make SOTM-EU a great event! Also a big thank-you to all the other sponsors to date: 123map, Toursprung, PTV Group, Mapbox, Omniscale, Synyx, Contargo, Sigma, Optitool, Mentz DV, Koehler & Leutwein, OpenCageData, Init and Geofabrik. SOTM-EU depends on the goodwill of sponsors to make it an event to remember for our participants. We're not making a profit, but the ticket price only covers a part of the costs for venue, staff, and catering. We're still looking for sponsors - we can use your help too! Please email sponsor@sotm-eu.org for details. We received 74 submissions in response to our call for presentations. Thank you! Our programme committee now has the job of selecting about 30 of the best full-length talks plus a couple of lightning talks. This is not going to be an easy task since most of the submissions are really good. In addition to this large group of OSM community members, we have also invited our host, the Karlsruhe University of Applied Sciences and especially Prof. Dr. Detlef Günther-Diringer to help us select presentations. We're also counting on Peter Mooney of the National University of Ireland Maynooth to say his part when we're discussing academic talks. Mid to late April we'll contact everyone who has submitted a presentation and inform them whether we were able to accept their submission and when it's scheduled. In some cases we might also have additional questions, or ask for a modified abstract for the programme publication. Visitor registration for SotM-EU 2014 is now open! SotM-EU 2014 takes place from 13th to 15th June 2014 in Karlsruhe. There will be talks on Friday and Saturday; Sunday is reserved for workshops and the hack day. "Early bird" tickets are available at a price of EUR 55 until 30th April 2014; the regular ticket price (starting 1st May 2014) is EUR 80. So you're wondering how to get to the conference - where the nearest airport is, and where to go once you're in Karlrsruhe? Our Location and Getting There pages will tell you everything you need to know! Today the programme committee released the Call for Presentations for SotM-EU 2014. Have you developed an OSM related tool? Are you a mapper, an OSM user, an advocate, or working on something else related to OpenStreetMap? Submit a talk and visit us in Karlsruhe. The Call for Presentations ends at 28 February 2014. 17 March 2014. We are happy to hear your ideas! The “State of the Map Europe” comes to Karlsruhe! The State of the Map (SotM) is OpenStreetMap's annual conference. It has been held regularly since 2007 at different places around the world. With the State of the Map Europe (SotM-EU) in 2011, a European branch of this biggest OpenstreetMap conference has been established. After the huge success of the first SotM-EU in Vienna, we're proud to invite you to join us on the Weekend of 13th to 15th June 2014 for the second “State of the Map Europe” on the premises of the Karlsruhe University of Applied Sciences. In the course of the next few months we'll extend this site step by step. We're planning to open the call for papers in early December. The submitted presentations will be judged by an international programme committee, so that we’ll be able to release the preliminary programme around March. Registration will be possible from early 2014. The Karlsruhe University of Applied Sciences is co-hosting the event and provides the venue. We were able to enlist the support of the cartography department which is part of the faculty named “Fakultät für Informationsmanagement und Medien”. There's still some time until the call for papers starts, but we're already looking for sponsors. As a sponsor you have the opportinity to place your logo and have your company name mentioned, as well as the permission to distribute promotional materials to conference participants. We're still working on fleshing out the sponsorship packages, but feel free to contact us already if you're interested.